The Tuck School of Business at Dartmouth is distinctive among the world's great business schools. We combine personal scale with global reach, thought leadership with first-rate teaching, rigorous coursework with experiential learning, and valued traditions with innovation. We believe the highest form of education comes when great students and great thought leaders openly share knowledge and approaches to problem solving in a vibrant and dynamic learning community. At Tuck, we educate and develop principled leaders of business and society who motivate and lead others to make a difference. Like many other schools, Tuck wants to know that you love it for what it is, not only for what it can do for you; show that you have researched the school thoroughly. The class of 2011 reports an average GPA of 3.53 and GMAT score of 712. Students call posh, pretty Hanover “the quintessential small, New England, Ivy League town,” “within a short drive of many great ski resorts” and far removed “from the hustle and bustle of a big city.” Unlike at many schools, most first-years live on campus. Couples and families live in the Dartmouth-owned Sachem Village housing complex or elsewhere off-campus. The environment is extremely “intimate” and “supportive.” Tuckies consider their school very family-friendly, telling us that partners are an integral part of the social scene, and note that “classmates who have children while at Tuck” are surrounded by a “phenomenal support network.” Tuck is very inclusive of gay and lesbian students and partners. The isolated location and clustered housing contribute to “a great deal of school spirit” and “strong camaraderie” in a “work-hard, play-hard environment.” “Tuck students really transplant their lives to be here...we make friends quickly here and socialize a lot with our classmates.” Students belong to more than 60 clubs, teams, and publications, and attend numerous social functions every week. “The end of the week is typically characterized by social mixers (Tuck Tails), small group dinners…and the occasional full-blown party (win­ter and spring formals, Tuck Vegas, beach party).” Students report that “sports are very much a part of life at Tuck.” No one gripes about the intimacy, which results in great friendships and means close busi­ness ties in the future. “I have had a substantive conversation with each of my 240 class­mates and will feel very comfortable calling any of them after graduation for career advice and/or business counsel,” reports one Tuckie. The class of 2013 is 34 percent international and an additional 14 percent minority, however, sometimes students note they wish there was a bit more diversity. Tuck is “very focused on helping students land the jobs they came here to get.” “The Career Development Office works tirelessly on behalf of students,” though this benefit is most useful for students pursuing “traditional career paths (i.e., consulting, finance, gen­eral management).” However, “students interested in other opportunities (i.e., market­ing, retail) may need to do more work outside the Career Development Office.” Dartmouth is a magnet for recruiters, and “one of the best parts of Tuck is that visiting executives spend meaningful time with us. They don’t stop by on their way to another meeting; rather, they have lunch and/or dinner with us, hold individual office hours, and make an effort to share their experiences with members of the class.” Recruitment is Northeast focused, but the career office “is continually trying to reach out to West Coast firms”—the ones who often “recruit locally at Stanford and UCLA”—”and does a couple of treks for students interested in returning to the West.” The tides may be turning; one student reports seeing “Google, Microsoft, and PG&E on campus this year,” a possible “indication that a more diverse lineup of firms [is] coming to Tuck.” Students seeking jobs in “nontraditional” vocations and regions will have better luck with Tuck’s extremely strong, supportive alumni network. One student told this story of success: “I emailed a Tuck alum who is a managing director at a bulge-bracket investment bank in London, and he called me 5 minutes later to talk. He arranged a personal office visit…and actually talked HR into sending me straight to second round interviews, because the firm’s London office didn’t recruit on campus…all because I put ‘Tuck’ in the subject line.”Tuck’s most recent graduating class reports a median total annual compensation of $179,000. 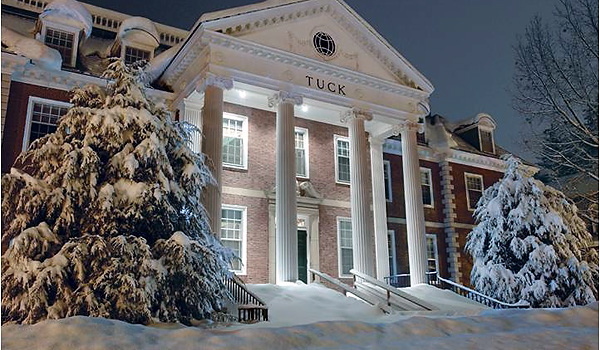 Tuck provides an intense learning environment with a diverse community of people who learn from each other. More than a quarter of Tuck's faculty are of international origin and over 30 percent of Tuck's study body come from outside of the United States. Tuck offers an optional International Orientation Program designed for international students who are prepared for the academic aspects of the first-year curriculum but do not have a great deal of experience working or living in the United States. Throughout academic year, Tuck also offers a variety of internationally focused community events and student-run clubs. Community events include the Country Chat Series, the International Food Festival, and the annual Tuck International Forum. Student clubs include the Asia Business Club, the Latin American Club, the International Club, the Africa Club, and the South Asia Club. The Tuck Gay/Straight Alliance is a resource and support group for gay, lesbian, bisexual, and transgendered members of the Tuck community. The alliance co-hosts Tuck's annual Diversity Conference as well as the Reaching Out Conference. Tuck has a variety of student-run clubs, many of which focus on a particular culture, ethnicity, or nationality. These include the Hispanic-American Student Association and the Tuck African Ancestry Business Association. Tuck also hosts an annual Diversity Conference which brings together students, prospective students, faculty, alumni, and visiting executives for a weekend of discussion, networking, mentoring, and socializing. Second-year Tuck students act as tutors for first-year students in Accounting, Statistics, Decision Science, Economics, Capital Markets, and Corporate Finance. Tuck positions women for successful careers by helping students and alumnae make the best connections - with each other and with businesses. Tuck is active in a range of organizations and offers many advantages and opportunities for Tuck women. These include the Forte Foundation, the Women in Business Club, and Ascent: Leading Multicultural Women to the Top. Tuck also hosts an annual Women in Business Conference where female professionals come together to take part in panel discussions and workshops dedicated to developing strong skill sets, networks, and mentor/mentee relationships. Want more info about Dartmouth College, Tuck School of Business Full Time MBA? Get free advice from education experts and Noodle community members.